Make the marinade: Blend all of the marinade ingredients (paprika through yoghurt) together in a food processor until smooth, OR finely chop the garlic, ginger, and cilantro and mix with the rest of the marinade ingredients. Season to taste with salt. Put the chicken cubes into a glass bowl, and fold in the marinade – mix until thoroughly coated. Cover the bowl with plastic wrap, and marinate overnight in the fridge (or for at least 6 hours). Heat your oven to 400° F. Thread the chicken cubes onto four metal skewers (or wooden skewers that have been soaked in water for at least 30 minutes). Set the skewers onto a metal rack set atop a baking tray. Roast, uncovered, for 15 to 20 minutes, or until the chicken is fully cooked and browed around the edges. Make the masala: In a small fry pan, heat the cardamom pods (with no oil) until fragrant – place into a spice grinder or mortar and pestle. Next, heat the cinnamon pieces in the same fry pan until fragrant. Add to the cardamom, and grind the spices to a fine powder; set aside. Heat the oil in a heavy-based saucepan over low heat (with just enough oil to cover the bottom of the pan). Add the onion, and fry until soft and starting to brown. Place the onion into a food processor and purée until smooth; set aside. Wipe out the pan, and add more oil. Add the garlic and jalapeños to the pan and cook for one minute. Stir in the tomatoes, puréed onion, spices and sugar – cook until the paste thickens. Remove the pan from the heat to add the cream and almonds – return back to the heat, and stir in the chicken pieces. 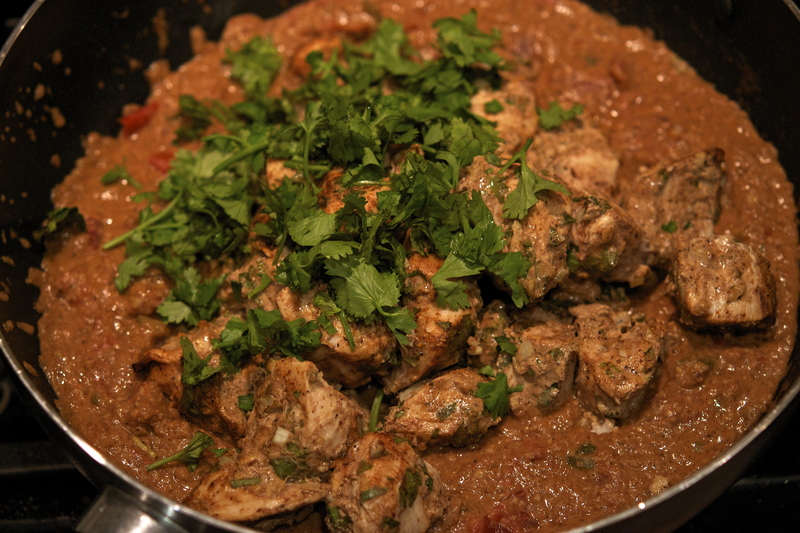 Allow to cook for 5 minutes, or until the chicken is warmed and coated with the masala. Note: the sauce might start to dry out – slowly add water (by the tablespoon) and stir if this happens. Top with chopped cilantro and serve with rice.